How To Get To Greenhills Shopping Center? Greenhills Shopping Center, located in San Juan, is a mid-to-upscale bargain center catering to all social classes who are looking for cheap thrills with stylish branding. With thousand of stores and stalls, one needs more than a day to finish roving around the center. The shopping arcades are usually crowded every Christmas as young and old people troop to Greenhills not only to buy gifts and giveaways but also to witness the lifesize mannequin show, that is the "Christmas on Display" (C.O.D.). Tourists and foreign visitors are also brought here to shop for cheap versions of branded items as well as Filipiniana souvenirs. 1. Virra Mall (now known as V-Mall) - a newly redesigned mall with a new outlook (like refraining from selling pirated CDs and DVDs and focus on original materials). This area is more known as a computer store hub with a bunch of retailers and direct seller shops present in the mall. 2. A huge airconditioned Tiangge area connected to V-Mall, Shoppesville, and TheaterMall. 3. Annapolis Carpark Square and Connecticut Carpark - parking area doubling as buildings with restaurants and bars. 4. Shoppesville Arcade - a four-story center that focuses on selling local and imported goods, RTWs, toys, and computers. 6. Promenade - just built a few years ago, this area contains Cinemas 3 to 5, restaurants, dessert shops, bookstores, KTVs. 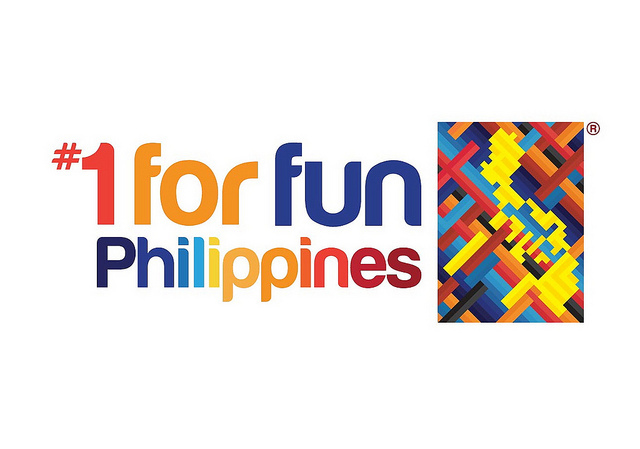 Basically, this activity center focuses on the hip and young visitors of Greenhills. 7. The Jewellery - a bridgeway that houses around a dozen jewelry stores. 8. Music Museum and Teatrino - venues for concerts, comedy shows, and big corporate and social gatherings. 10. Club Filipino, the landmark venue for historical events such as former President Cory Aquino's oath-taking. 11. Roman Catholic chapel and a Muslim prayer room can also be found here. 12. A myriad of beauty and wellness centers can also be found in Greenhills. Mall Hours: 10A-8P from Sundays to Thursdays; 10A-9P on Fridays and Saturdays. Of course, the cinemas and restaurants, as well as establishments around the malls are open until later into the evening. Mass Schedules are: 1215pm Mon-Sun, 6pm Thurs, 530pm every 1st Friday, 530pm Sat (anticipated), and 9am, 1230pm, 530pm Sunday mass. One can also get to Tiendesitas via the free shuttle service (in front of Mercury Drugstore in Connecticut Carpark) every hour from 2pm to 8pm. Public Transport Terminals are also available at the main entrance of Greenhills Shopping Center along Ortigas Avenue: Greenhills to Fairview (from 10am to 10pm), Greenhills to Marikina (5pm to 10pm), Greenhills to Pasig (12pm to 10pm), Greenhills to Ortigas Center (10am to 10pm). Remember to take note that Greenhills Shopping Center's main landmark boundary streets (clockwise) are Ortigas Avenue, Club Filipino Avenue, Eisenhower, Annapolis, Missouri, and Connecticut Streets. Nearest MRT 1 stations are Ortigas and Santolan. Option 1. From Monumento, you can ride a bus passing through EDSA going to going to Ayala, MIA, SM Mall of Asia or Baclaran and get down in Ortigas. From the corner of EDSA and Ortigas, ride a jeepney or bus (G-Liner) bound for San Juan or Quiapo and get down at Greenhills. Option 2. You can also take a bus up to North Avenue and then ride the MRT and get down at Ortigas Station and walk northbound. From the corner of EDSA and Ortigas, ride a jeepney or bus (G-Liner) bound for San Juan or Quiapo and get down at Greenhills. Option 3. From Monumento, you can ride a bus passing through EDSA going to Ayala, MIA, SM Mall of Asia or Baclaran and get down at Gate 5 (there's a Caltex Station there). From the corner, ride a jeepney bound for Greenhills. Option 4. You can also take a bus up to North Avenue and then ride the MRT and get down at Santolan Station and walk southbound to Annapolis Street. From the corner, ride a jeepney bound for Greenhills. Option 1. From EDSA, ride a bus going to going to Ayala, MIA, SM Mall of Asia or Baclaran and get down in Ortigas. From the corner of EDSA and Ortigas, ride a jeepney or bus (G-Liner) bound for San Juan or Quiapo and get down at Greenhills. Option 2. Ride the MRT and get down at Ortigas Station and walk northbound. From the corner of EDSA and Ortigas, ride a jeepney or bus (G-Liner) bound for San Juan or Quiapo and get down at Greenhills. Option 3. From EDSA, ride a bus going to Ayala, MIA, SM Mall of Asia or Baclaran and get down at Gate 5 (there's a Caltex Station there). From the corner, ride a jeepney bound for Greenhills. Option 4. Ride the MRT and get down at at Santolan Station and walk southbound to Annapolis Street. From the corner, ride a jeepney bound for Greenhills. Option 1. From EDSA, ride a bus going to going to Monumento or Fairview and get down in Ortigas. From the corner of EDSA and Ortigas, ride a jeepney or bus (G-Liner) bound for San Juan or Quiapo and get down at Greenhills. Option 3. Ride the MRT and get down at at Santolan Station, cross to the other side (Camp Crame) and walk southbound to Annapolis Street. From the corner, ride a jeepney bound for Greenhills. Option 1. Ride an LRT 1 bound for EDSA-Taft Avenue or jeepney bound for Baclaran (get down at EDSA). From EDSA, ride a bus going to going to Monumento or Fairview and get down in Ortigas. From the corner of EDSA and Ortigas, ride a jeepney or bus (G-Liner) bound for San Juan or Quiapo and get down at Greenhills. Option 2. Ride an LRT 1 bound for EDSA-Taft Avenue or jeepney bound for Baclaran (get down at EDSA). Transfer to the MRT and get down at Ortigas Station and walk northbound. From the corner of EDSA and Ortigas, ride a jeepney or bus (G-Liner) bound for San Juan or Quiapo and get down at Greenhills. Option 3. Ride an LRT 1 bound for EDSA-Taft Avenue or jeepney bound for Baclaran (get down at EDSA). Transfer to the MRT and get down at at Santolan Station, cross to the other side (Camp Crame) and walk southbound to Annapolis Street. From the corner, ride a jeepney bound for Greenhills. Option 1. Ride an LRT 2 bound for Araneta-Cubao and get down there. From EDSA, ride a bus going to going to Monumento or Fairview and get down in Ortigas. From the corner of EDSA and Ortigas, ride a jeepney or bus (G-Liner) bound for San Juan or Quiapo and get down at Greenhills. Option 2. Ride an LRT 2 bound for Araneta-Cubao and get down there. Transfer to the MRT and get down at Ortigas Station and walk northbound. From the corner of EDSA and Ortigas, ride a jeepney or bus (G-Liner) bound for San Juan or Quiapo and get down at Greenhills. Option 4. Ride an LRT 2 bound for Gilmore Station and get down there. Ride a San Juan bound jeepney. Ask the driver to bring you to the terminal for jeepneys bound for Ortigas/Robinson's Galleria; once there, ride the jeepney and get down at Greenhills Shopping Center. via bus: From Quiapo, ride a bus (RCGG or G-Liner) bound for Ortigas/Cainta and ask to be dropped off Greenhills. via jeepney: You can also try riding a Cubao-bound jeepney from Quiapo/Divisoria. Go down at Gilmore and ride a San Juan bound jeepney. Ask the driver to bring you to the terminal for jeepneys bound for Ortigas/Robinson's Galleria; once there, ride the jeepney and get down at Greenhills Shopping Center. Option 1. Ride a bus going to going to Monumento or Fairview and get down in Ortigas. From the corner of EDSA and Ortigas, ride a jeepney or bus (G-Liner) bound for San Juan or Quiapo and get down at Greenhills. Option 2. Ride a bus going to going to Monumento or Fairview and get down in Magallanes MRT Station. Ride the MRT and get down at Ortigas Station and walk northbound. From the corner of EDSA and Ortigas, ride a jeepney or bus (G-Liner) bound for San Juan or Quiapo and get down at Greenhills. Option 3. Ride a bus going to going to Monumento or Fairview and get down in Magallanes MRT Station. Ride the MRT and get down at at Santolan Station, cross to the other side (Camp Crame) and walk southbound to Annapolis Street. From the corner, ride a jeepney bound for Greenhills. From Tiendesitas, free shuttle service are also available from 3pm to 7pm in front of the Delicacies Village. The shuttle leaves every hour. From Ortigas, from the corner opposite of Philippine Overseas Employment Agency (POEA) or Robinson's Galleria, there are jeepneys bound for San Juan or buses bound for Quiapo, ride those buses and get down at Greenhills. 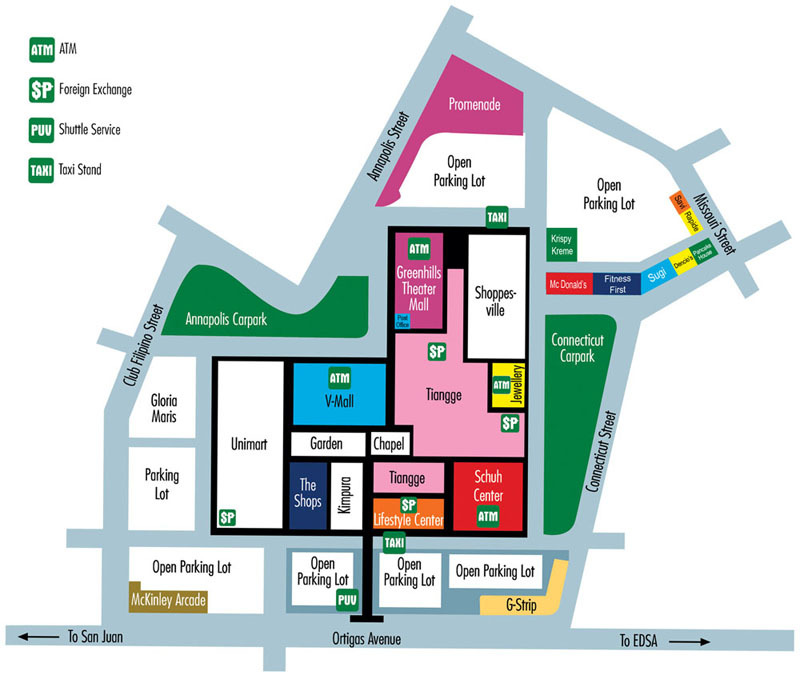 For private vehicles: Greenhills Shopping Arcade is located along Ortigas Avenue. From EDSA southbound, it is accessible either via Ortigas Avenue, Annapolis, or Connecticut streets. The area is already traffic-heavy during normal days (but lighter on weekends) and expect bumper-to-bumper heavy traffic during Christmas season. 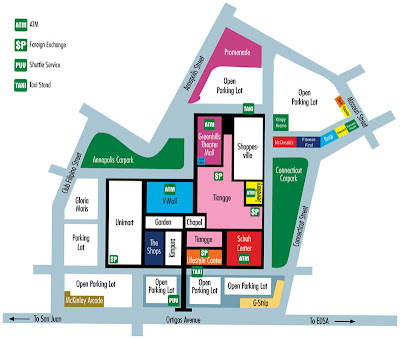 Parking is ample in this area though when crowded, it is advisable to drop your companions first in the mall and proceed to parking as finding a space is very tedious and time-consuming. Of course, you can ride a taxicab from any area around the metro and just mention "Greenhills" and the driver already knows where to go. What day of d week, where in muslin stores are closed? Thanks for pointing out the nice social commerce blog. However I feel so happy for to get good information and get a life! This is my recent comment in your article and thank you so much for all. You done acquire to be an extraordinary artist to succeed. This shopping base for style designs might helpful to our http://www.essayscoupon.com/bestdissertation-org-review/ interest. Thank you to give us so much valuable educating information. Thanks for all the concepts. Thank you very much for clear direction. Can i walk from gilmor station to ronac art center? Or it's too far? if im from the north where should i stop? Thanks for this informative and unique post. When is Gujarat Board SSC Results Declaration Date coming out? Please tell me when Gujarat board will declare results for class 10. I am waiting for my results and I want its soon. Thank you for your information in this article. It's very interesting. Nice Collection For Mothers Day 2017. This Day is Very Special For all kids and child.this day is hounarble for all Mothers. Celebrate Mothers Day 2017.This Day is very special for all mothers,grandmothers. Great institute. Best choice among the students. It was very informative content. Awesome blog,thanks for sharing,really very helpful. Important post dear. Thank you so much for the important post. As explained above one way is, it can start when the computer system is started. A lot of times, user downloads free programs from the Internet. At best, you'll be able to recover a couple of kilobytes of fragments. If it had free video editing software for windows 7 or data copy, you'dve had a chance. All three means your data is gone, Depends on how crushed it is. Candidates will be able to download the NEET 2019 Admit card online from the NEET 2019 official website.